A tent – first and foremost – provides the basic survival need of shelter. The first evidence of tent construction can be carbon dated to around 40,000 B.C. where the protective elements of the tents were made from Mammoth hides. Over the centuries this proved rather impractical, particularly due to their smell and lack of portability! The ancient Greeks and Romans provided tents for their soldiers; they were built using wooden support frames and large cloth coverings. As the U.S. Army began its westward movement across North America, it adapted the Native American tepee into portable shelters. The Sibley Tent, invented by the American military officer Henry Hopkins Sibley, differed from other tents of the time by borrowing the unique cone design of the tepee. By World War I larger tents were being used to provide shelter for support activities and supplies. 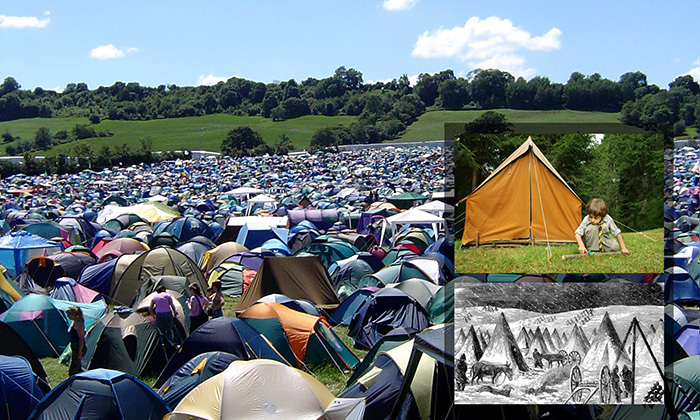 The 1970s saw a boom in interest in backpacking and camping, and designers began mass producing camping tents. Manufacturers began to experiment with lightweight metal poles and weather resistant fabrics such as nylon and polyester. Simple frames that snap together were developed and the use of pegs was introduced to hold the fabric and frame locked into the ground. Today, consumers have a huge choice when shopping for tents, from luxurious family accommodation with separate bedrooms and living spaces to activity-specific tents designed for mountaineering, trekking and more. Synthetic fabrics have proved wondrous weather resistant fabrics for today’s outdoor shelter needs but have one drawback – they break down under UV light. To maintain the durability of tents Nikwax offers Tent & Gear SolarProof to protect against UV deterioration and to maintain water repellency. Just one application can double the effective life of a tent! Throughout history the tent has evolved from a means of necessary shelter to an indispensable piece of camping gear for today’s outdoor enthusiast. We can only imagine what the next millennia will bring in the evolution of this fabric mobile home!